Here is one of the most difficult tasks a tenant takes, when dealing with a burst pipe and water through ceiling, that isn’t even there fault. What you should do, is call the landlord and then the landlord will get an emergency plumber to you in an emergency. What happens when the landlord is un-reachable? Unless your going to take the risk in calling a 24 hour emergency plumber yourself and going to try and claim the money back of the landlord. Maybe! Martin Smith is an experience emergency plumber, he takes so many calls around the UK and can almost guarantee a tenant will call each day. Some situations where there is water through ceiling, some not. Some tenants will pay without consent of the landlords, some will hold off until they get confirmation. Some try to claim the money back of the landlord, but fail. It is very common that a tenant will call and say, I have a water leak or I have water though ceiling can you bill the landlord. The emergency plumber will then say, can you get the landlord to call us and get authorisation to take on the plumbing emergency. Tenant then says, well thats the problem, I can’t get hold of the landlord as he/she not answering the phone. If the emergency plumber decides to go out under the thought that the landlord can pay, then the emergency plumber is wrong, as proven so many times. If the landlord doesn’t want to pay, then he/she doesn’t have to by law. As far as the landlord is concerned, they shouldn’t of called anyone out and the mains stop valve should of been turned off stoping any water through ceiling. They never seem to get the circumstance as they are not obliged to pay the fee of an emergency plumber. Martin Smith explains that the law based around the emergency services when it comes to tenant and problems such as water through ceiling is not satisfactory and believe there should be a shake up with the law when it comes to an emergency service to the plumbing or the electrical and maybe anything else urgent as it comes to that matter. There should always be an emergency contact within the contract that is given to the tenant, that’s if there unable to get in contact with the landlord or letting agency and they have proof of this, then there should be some kind of back up involved. We would like to get some sort of partition going for the protection of tenants, with an agreement on what should be done in any type of an emergency, where ever they call an emergency plumber them selves within reason or there becoming an emergency line set up for all tenants. Martin Smith believe that all landlords should have insurance, specially for water through ceiling, for the reason, covering any emergency crisis. 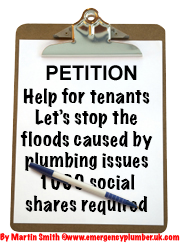 We would like you to tweet this, share it around socially or if your a plumbing company or anything to do with lettings, then send us an email to emergencyplumber@me.com and we will add you to a petition list of people wanting to make life better for tenants. If we get more that 1000 likes and tweet, we may be in for a change to the system. If you would like any help in a situation, where you need an emergency plumber, then please give us a call on the above contact number. 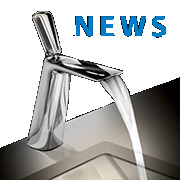 If your an emergency plumber and don’t mind dealing with tenants when water is coming through ceiling and the tenant is going to pay, then please join our plumbing register.